A curving “eyebrow” over the entrance has historical precedent. Along with the windowed bay, the roof eyebrow provides a focal point in what is otherwise a very plain house in its massing and façade. 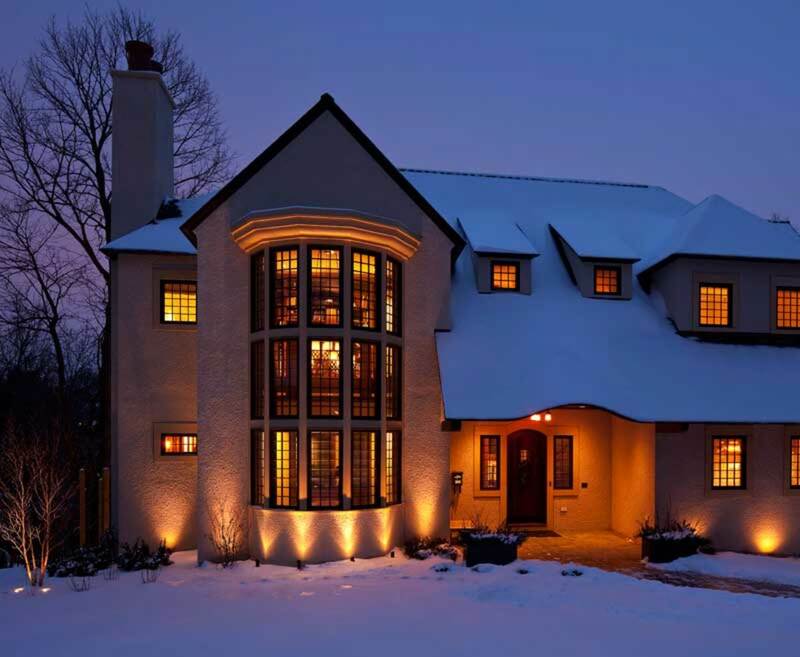 Before they moved to Minnesota, this family had lived in one old house—in San Francisco—and they liked the idea of collaborating with an architect to build a “new old house.” To oversee its design, they chose Joseph Metzler of SALA Architects in Minneapolis. “Joe asked the questions, and we gave answers,” Elizabeth says. She and her husband, Ian, always had been drawn to houses of the Arts & Crafts period. 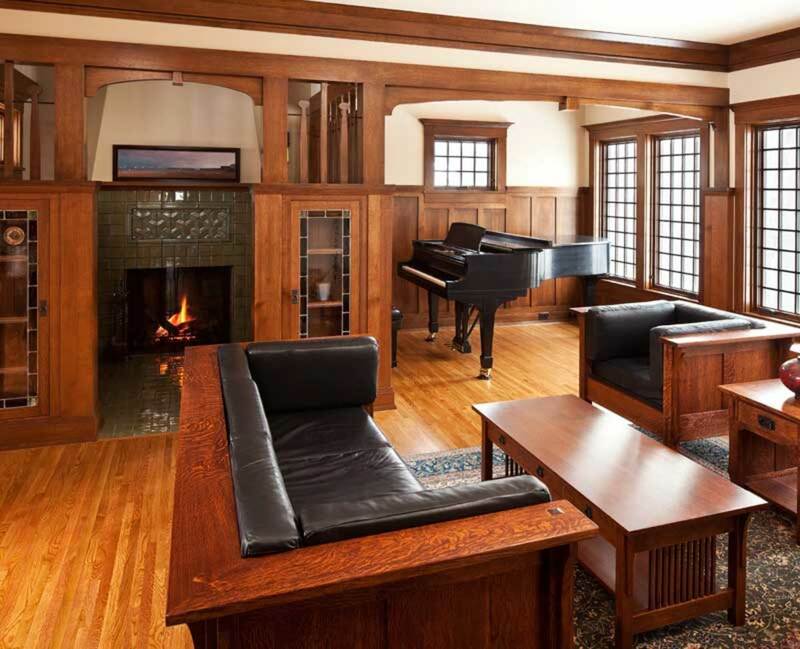 They especially liked the landmark Plummer House in Rochester, Minnesota, a house in the English Arts & Crafts style, which had belonged to one of the original partners of the Mayo Clinic. “We hoped our (new) house would look like it might have been built for or by one of his children,” Elizabeth says. Metzler collaborated closely with architect Steven Buetow, formerly at SALA. The house borders a historic district, and the old houses inspired the general approach. The garage is discreetly tucked under the house in the rear slope. The exterior looks to the work of Voysey, Lutyens, and other English Arts & Crafts designers, Metzler explains. The interior, on the other hand, is more American Arts & Crafts. 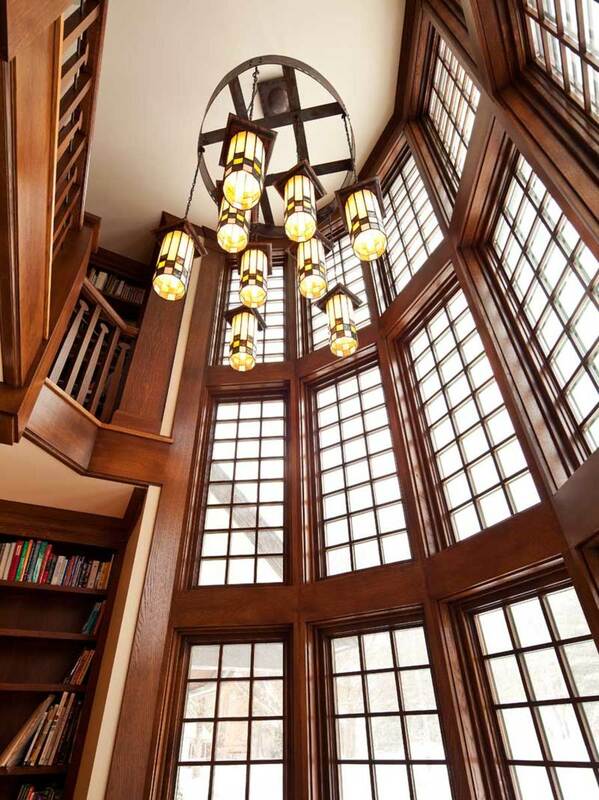 The chandelier was inspired by one hanging at the Roycroft Inn in East Aurora, New York. A full-height glass bay dominates the exterior. Leather chairs furnish a well-lit reading room downstairs, which can be closed off by French doors fitted with art glass. A book-lined balcony overlooks the main space. 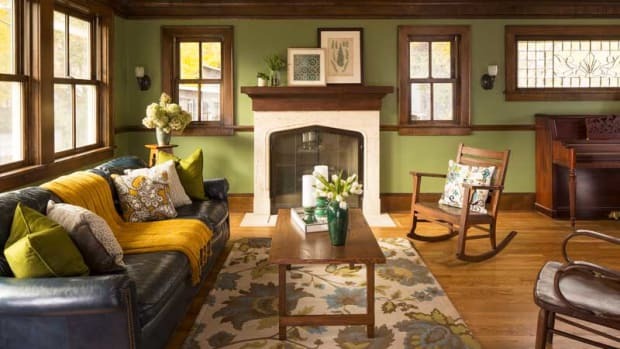 David Lees of Crestwood Designs in Victoria, British Columbia, made most of thefurniture in the living room. The coffee table is a new piece from Stickley. 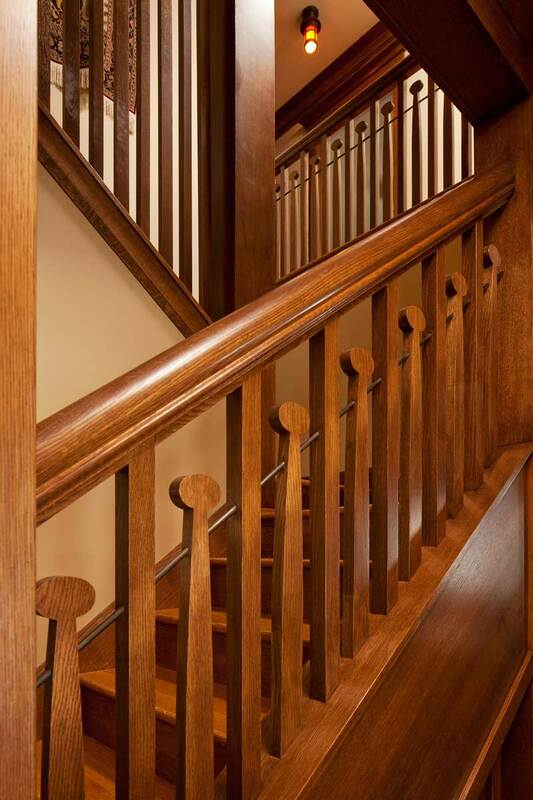 Whimsical balusters repeat a motif common to some Voysey-inspired homes. Inside the bay, the stunning nine-light chandelier was a custom collaboration between metalworker and glass artist. (Shane Jost of Mountains Edge Copper Art did the copper- and metalwork. The art-glass lanterns came from David Haight of the Rubaiyat Studio.) The fixture hung in the owners’ previous home; they dismantled and crated it for shipping. The library was designed around its dimensions. Metzler designed the art glass, incorporating a motif supplied by the homeowners, which ties Elizabeth’s Chinese heritage to her husband’s affection for the Mackintosh rose. “The rose is also a reference to one of my husband’s favorite hymns: ‘Lo, how a rose ere blooming,’” Elizabeth explains. 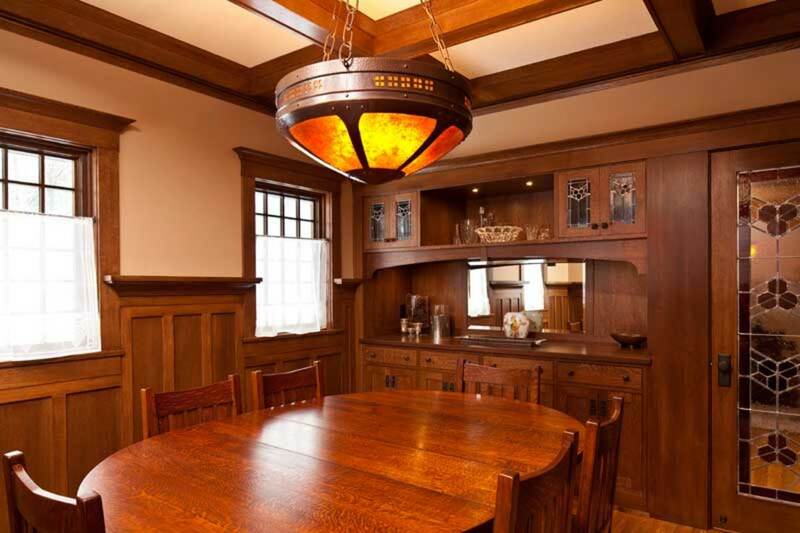 The beamed dining room has a large, six-panel, up-lit mica fixture made by James K. Davies of Craftsman Copper. 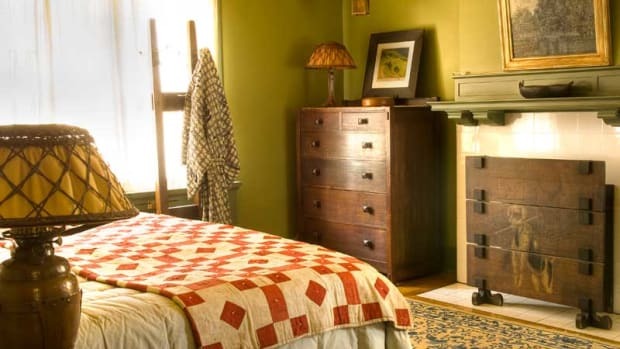 The built-in sideboard is typical of Arts & Crafts houses. Leaded art glass has a trefoil motif that repeats throughout the house. Seen in art glass in the buffet and French doors, the trefoil (suggesting a flower or rose) is based on Chinese lattice designs shown in a book by Daniel Sheets Dye. It is abstracted as a hexagonal lattice in such custom tile features as the fireplace surround. The hexagonal repeat recalls designs that would have been common in Chengdu, in the Szechuan region of China, around the time that Elizabeth’s father’s family lived there (ca. 1900). Breaking the hexagon in half was a practical suggestion made by Roger Mayland of North Prairie Tileworks. 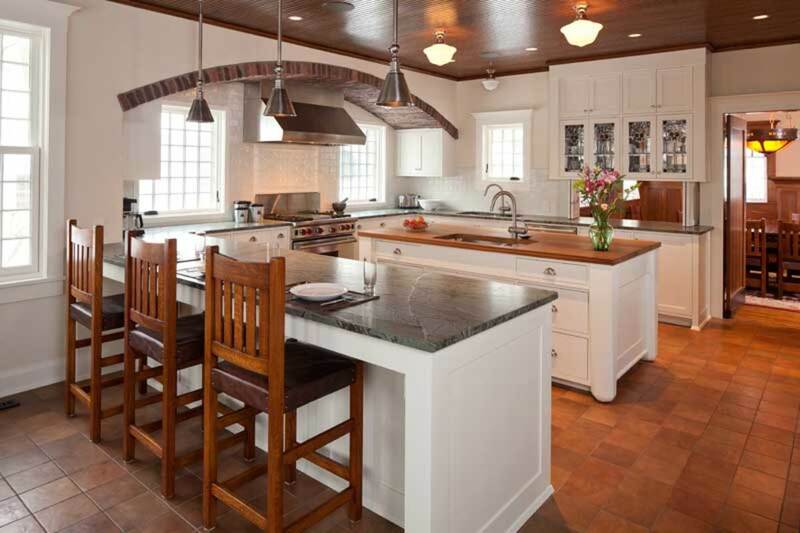 The kitchen has an unusual but practical configuration, offering a room-dividing peninsula, a prep island with a second sink, and a pass-through to the dining room. Embracing the idea of a “new old house,” the owners were able to accept a more contemporary feel in the kitchen, given their “story” that this once would have been exterior space, later enclosed and repurposed—hence the stuccoed walls and exposed brick arch, the serviceable beadboard ceiling and floor tiles. The room is divided into prep, cooking, wash-up, and baking zones, with storage for each purpose nearby. The couple has begun to collect vintage pottery. But “our take on this being a Craftsman house is that we should support and encourage contemporary craftsmen,” says Elizabeth. 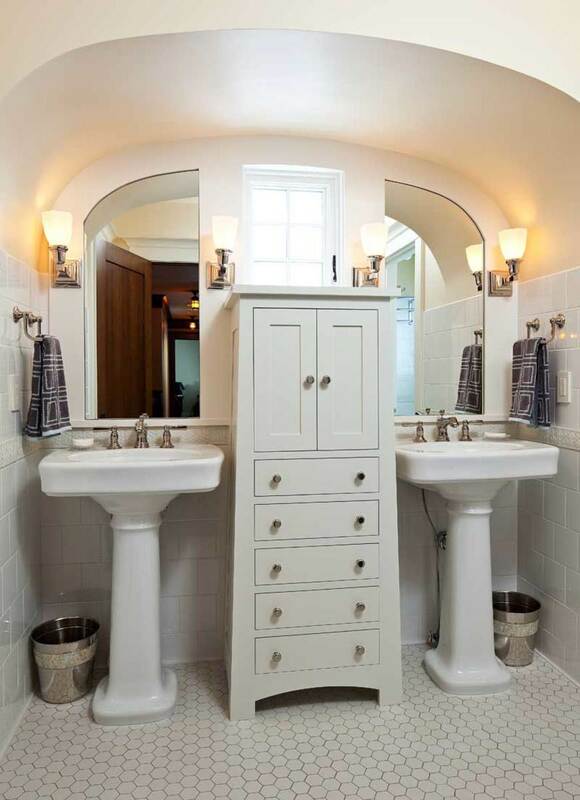 The master bath includes dresser-like built-ins. Recalling the best bathrooms of the early 20th century, these period-inspired rooms incorporate custom Arts & Crafts-style details. Both the master and boys’ bathrooms have built-in cabinets conceived of as tall, freestanding dressers, a refinement of bungalow-era millwork. 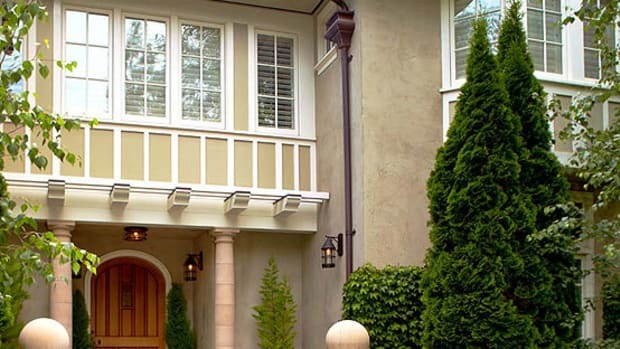 Sloped sides and the base treatment give them the look of Arts & Crafts furniture. 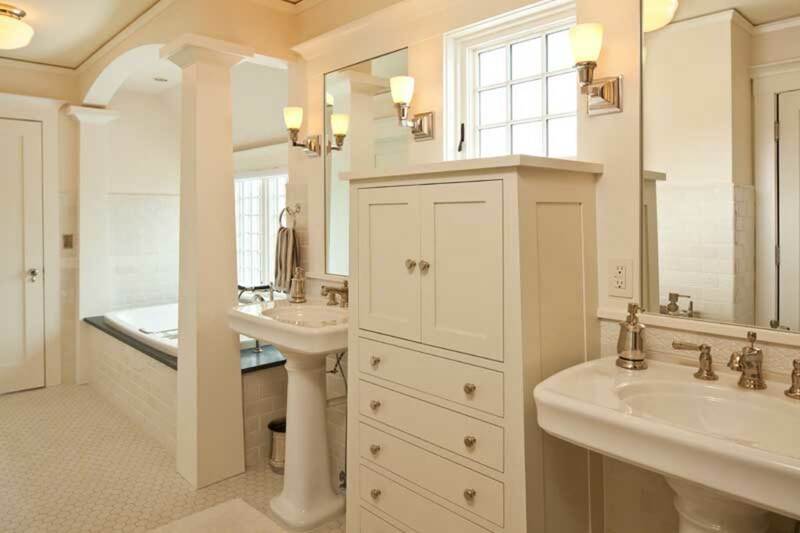 Reflecting the “sanitary” bathrooms of the era, millwork has a glossy, white-painted finish. Fixtures and lighting also repeat the look of bungalow-era bathrooms. As is so often the case in quirky old houses, a limitation led to a handsome design: The arch over the sinks was required due to low headroom at this end of the room under the slope of the roof. Oak and custom tile in a deep color provide a more “furnished”look in the downstairs powder room. Tile is by North Prairie Tileworks. (Subway tiles on walls have a custom glaze, Thayer 8. The floor is glazed with #19 Blue Green with the listello, or liner, in #190 Woo Blue. All are mid-range glazes from the company’s electric kilns.) Even here, though, the white plumbing fixtures remain a classic. “I particularly like that the white fixtures stand out in the warm-toned room; there’s no attempt to hide its function,” says Metzler. 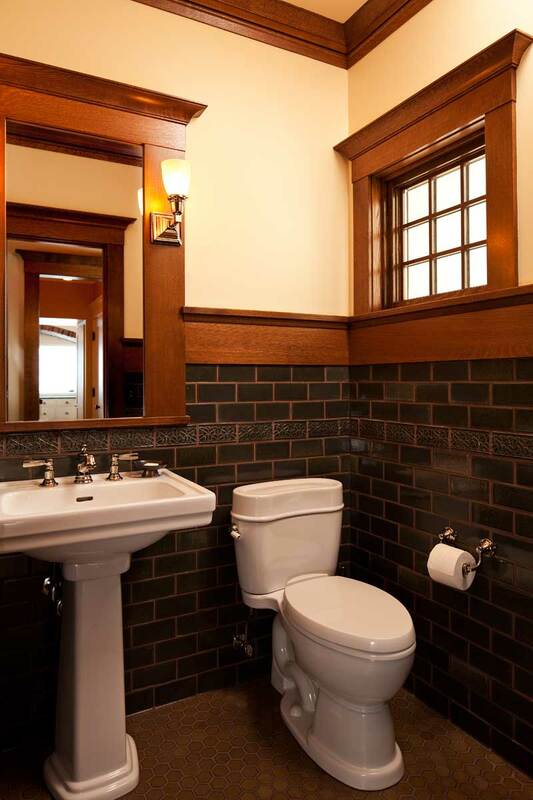 WIth its richly-colored tile, the powder room has an Arts & Crafts feeling.